Geoff Shows off his Monster! The Fraser River is fishing great these days for both Sturgeon and Cutthroat Trout, with the water still low and relatively clear this has been one of the most productive early springs we have seen in nearly a decade. The water temperature could well be one of the contributing factors and or the mild temperatures but either way we really like great fishing days. 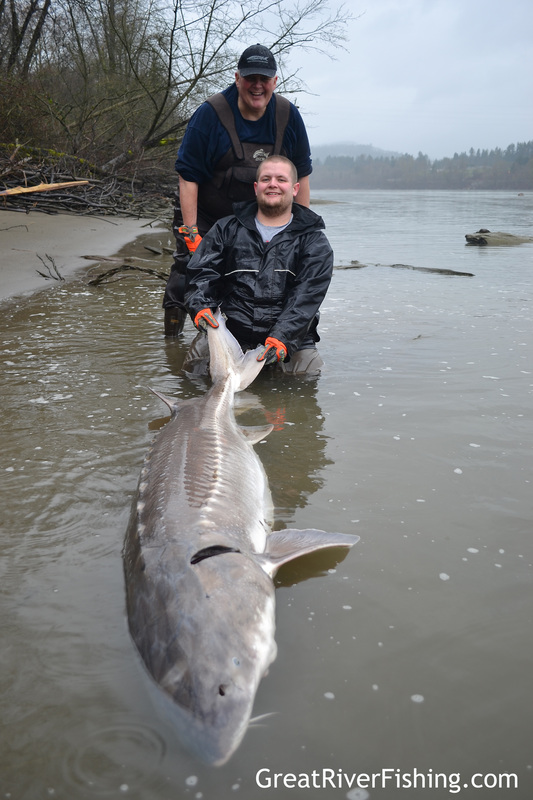 The Sturgeon fishing has been good from the mouth of the Harrison River all down to the Portman Bridge and we have been covering these areas on a regular basis. Our best baits this past few weeks has been Eulachon (most preferred), Lamprey and Roe. Keeping your baits pretty small has been good as well, like cutting Eulachon in 3 pieces and using it that way. Not only are the fish seemingly liking this better, it makes your bait go a longer way and as we all know great bait and having great bait cost money. The Sturgeon seem to be moving around already and you may need to move around a little away from the usual wintering areas to find the pod of fish, but once you key in on them, there are really biting well and all over the offerings. 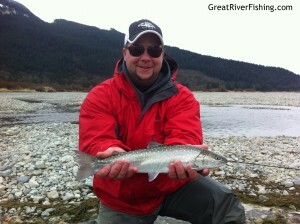 We have landed a number of great fish over 200 cm fork length in the past 2 weeks. Some good spots to check out are below the train bridge in the Harrison River to the curve and then at the mouth and confluence of the Harrison and the Fraser River and also right around the Island 22 boat launch just downstream as well as Big Hole about a ¼ mile below Island 22. The mouth of the Sumas canal, Cox’s landing to Hatzic corner (staying on the deep side – south banks), The Stave River outflow area down to the mills at the bottom of Crescent Island (north bank mainly) good 1 mile of fishing, bottom of Bedford Channel and also below Barnston Island in the 40 to 50 feet at the tip of the Island. Sturgeon Fishing should continue to stay good through the entire Spring season and if the fishing so far is any indicator to the year we are going to have, we are going to have some very happy clients and friends again in 2013. 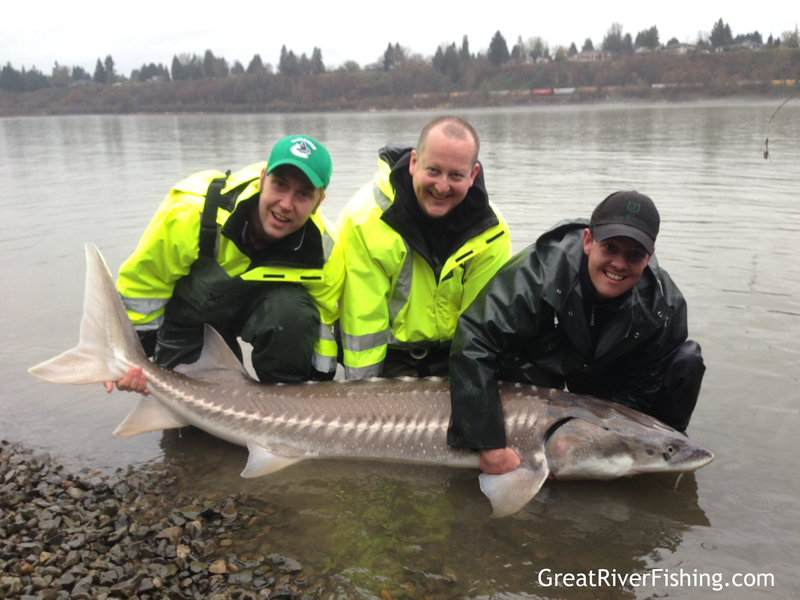 If you have any questions on Sturgeon fishing in our area visit us on our Facebook Page and leave us a message or send us an email. Todd and his Mighty Dino! On a special note – One thing to keep in mind when purchasing Eulachon this season is that you will be required to have a purchase receipt on you for your Eulachon you are using. This is the place of origin where the Eulachon came from. Both DFO – C & P Officers and also Provincial Conservation Officers can and will be checking fishers this season randomly. Eulachon are up for designation for a Sara – Species at Risk Act and this means all Fraser River Eulachon must be protected and not used as bait or to even have in your possession. Many Guide companies are not out at this time of the season or tell clients they don’t fish due to overwintering of the fish. But trust us when you tell you they would gladly be out fishing if they could but as the bookings seem to tail off in the winter most have other jobs. For our team, we are fishing year round – we may not be out every single day but we are on the water loads of days and are consistently hooking clients up with great fishing days. Our job is to have guides that eat and breathe fishing and we are able to keep some guides working as their full time jobs. Stay up to date and when looking at booking your next guided fishing experience, ask a few key questions. 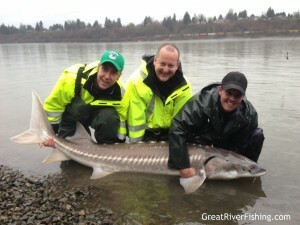 Do you tag sturgeon as part of the mark recapture program? Are you a year round fishing company? Check the company Facebook Pages and also their testimonials and last but not least ask for references. Sometimes paying a little more for angling adventure experiences is well worth the initial investment to ensuring your time on the river is the best that it can be. There is a reason companies charge less, they are less confident in their team and product. Many are filling up trips with outside outsourced guides that are part time. Book with confidence, make a phone call to your potential guide company and feel good about booking your next adventure of a lifetime. You work hard and you deserve a great experience for your hard earned dollars. The Trout Fishing has really been excellent for the past few weeks and right now it is on fire so if you are a casual or intense fly fisher, spoon chucker, bait floater or just looking for a fun day to be fishing in the Fraser River area, come join us. The river from Peter’s Road above Agassiz to the mouth of the Sumas River has produced some of the best fishing days in the past years. The river is stable and warming and this makes things come alive. One of the best spots we have been fishing is just upstream from island 22 and in the middle of the river, that great riffle has been holding some nice fish. We have been mainly targeting these on the fly but we also have had some spoon and spinner days that were second to none and gave some novice anglers a real sweet experience that they will not forget soon. Chances are there to intercept some migrating Steelhead always excited us and with the water being low in the Fraser right there are some key runs that can hook up. Below Grassy Bar has been productive all the way down through the Chilliwack Mountain area as far as Bowman’s Bar and let’s not forget the chance to get Steelhead on the tides at the mouth of the Sumas. The Harrison River has been super low – nearly 3.5 feet lower than usual years which really concentrates the fish and how much room they have to chase fry. This is a real bonus for the fly angler – dry lines and small to medium fly’s all work – we have been getting some great Dolly’s using big fly’s and stripping very fast after the fly comes around and we mean fast. Seems the uglier and bigger the fly the better reaction we are getting and the Cutthroat have been crashing every feeding. So many more days to come on the Harrison River this season as it is really just beginning and when the Fraser comes up for freshet then the Fraser will be done for Trout and we are expecting that to happen in the next 2 to 3 weeks at the most. 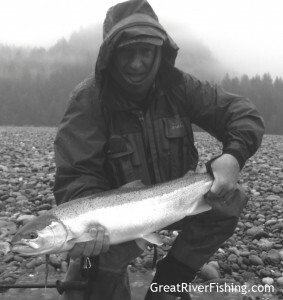 The Vedder River has been up and down with water levels but all and all it is really fishing well in the past week, whether you are throwing feathers, bait casting, center pin fishing or spin fishing this is the place to be and the fish are biting well. Someone the other day mentioned put a beer tab on and you will catch one easily, he was almost correct so if you try it and catch one then send us the picture. When the lower Vedder River from Sleese clay bank down is leaching with silt then you still have the entire upper portion to fish. There becomes a little more pressure but at this time of the year there are good numbers of fish present. The water conditions are usually always good in the upper reaches. Now the next month will be the best for the numbers of Steelhead in the river and a good time for beginning anglers to go out and learn and hone skills and techniques. With the number of fish increasing and the water temperatures rising makes the fish more grabby. For good experienced anglers these can be days when you can rack up some numbers and see the true beauty of these fish with their Pink rosy cheeks to their long bodies and those incredible square tails. Greg our long time team guide was out just before the river dirtied on the lower Vedder and had his best day of the season, 10 Steelhead landed. We have great lineup of Steelhead experts from fly fanatics to bait chuckers, guides passionate about this fishery and wanting to help you improve and learn. Ben, Curtis, Giovanni and Dave have been making adventure experiences unique and special for many over the years. Let our team take you out and show you why. Boat Ride to the Upper Pitt River! The Upper Pitt River, nestled in the Golden Ear’s area this river will be coming on again soon, usually we make a few trips up there in early May to chase some Dolly Varden, Bull Trout, Trout and even the odd Steelhead. 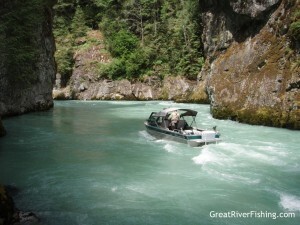 We have a team of guides that love this pristine wilderness fly fishing Mecca. In May to the end of July we see the most amazing return of Sea Run Dolly Varden, these fish love big fly’s and are aggressive on the take, they will take you on the swing and on the dangle an experience every fly angler should try. The end of July the Chinook return as well as the sockeye and they can all supply amazing fly days for levels of experience. The returns on Sockeye last season were the highest in years and these fish really chase the fly. Most will not believe this but if you have not experienced it then you really do not know what you are missing. By the end of August the river is usually ditch low and not fishing well so we move to other fisheries until in October when the Coho Salmon return. Somewhere between October 10 and November 10 will be the best fly fishing for Coho of the year and the river levels can vary. When the rain comes the fish move and if you are there on those days where they are resting and waiting it is like a gold rush, it is not uncommon to see pods of 100 or more Coho in pools and staging. 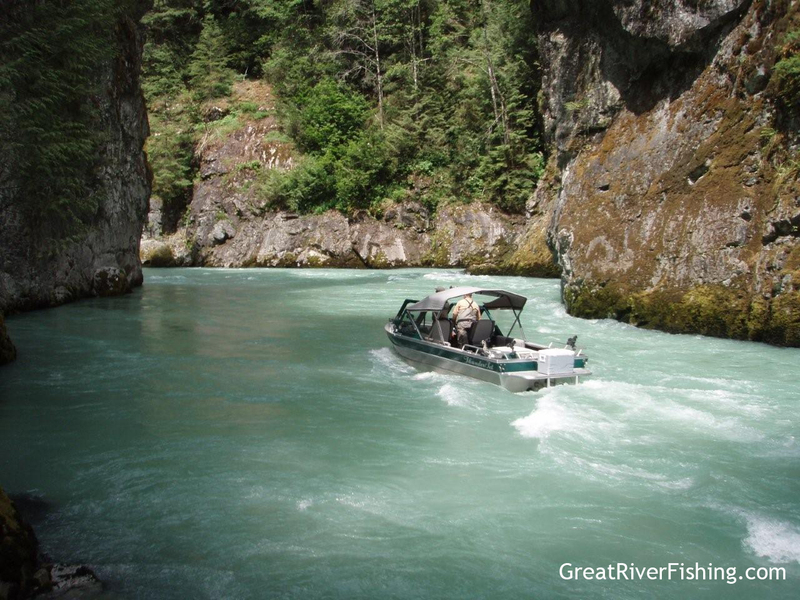 Get your best chance at the greatest boat ride in the Fraser Valley and some of the best scenic fly fishing days one could ever experience, book your dates early. Finally we would encourage all of you to keep our rivers and surrounding area’s clean from garbage and by taking out more than you brought in. If you see someone dumping Garbage please report this – if everyone does there part we will soon return to showing the world the beauty of our area and how proud we are of the efforts we make daily.